Google does not stop. As it moves towards a new iteration of Android, and while there is still a large fragmentation between different manufacturers of smartphones and tablets, we now know the existence of the beta version of Android 7.1.2 Nougat, which has just been released a few hours ago on the smartphones Nexus 6P, where Google has introduced a new feature that allows users to see alerts for battery usage. The option called 'Usage Alerts' has been included in one of the available menus within the battery configuration. Therefore, from this version will appear a list showing a series of applications that, during a normal download cycle, consume the battery of the device abnormally. 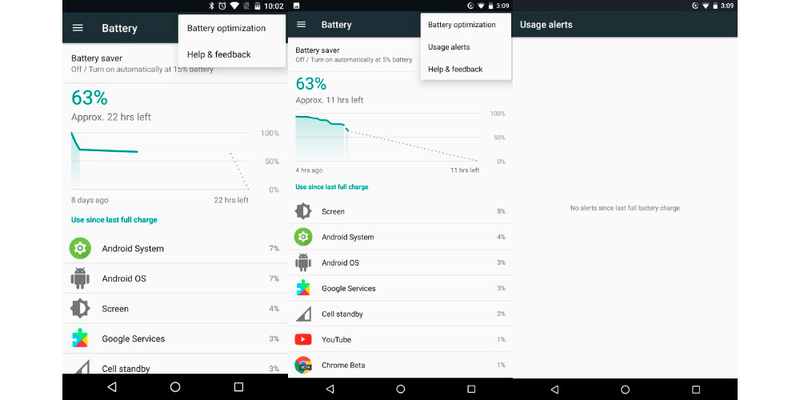 In this way, Google wants to help users check if a particular application is having an impact on the battery life of their smartphones. Thus, the beta version of Android 7.1.2 Nougat offers the opportunity to uninstall those applications that do more damage, instead of restoring everything from the classic factory settings. The feature is not new, since it already exists, for example, in Samsung and Huawei devices, but it is always nice to see that Google takes it into account and demonstrate wanting to remain vigilant about using the battery. All this comes at a time when many Nexus devices are suffering a great waste of battery through applications outside and inside the system, due to an error still unresolved and that, perhaps, can now have a solution. Be that as it may, and according to recent rumors, it is likely that the stable version of Android 7.1.2 Nougat is released in early April on most smartphones where now runs the previous version of Nougat.